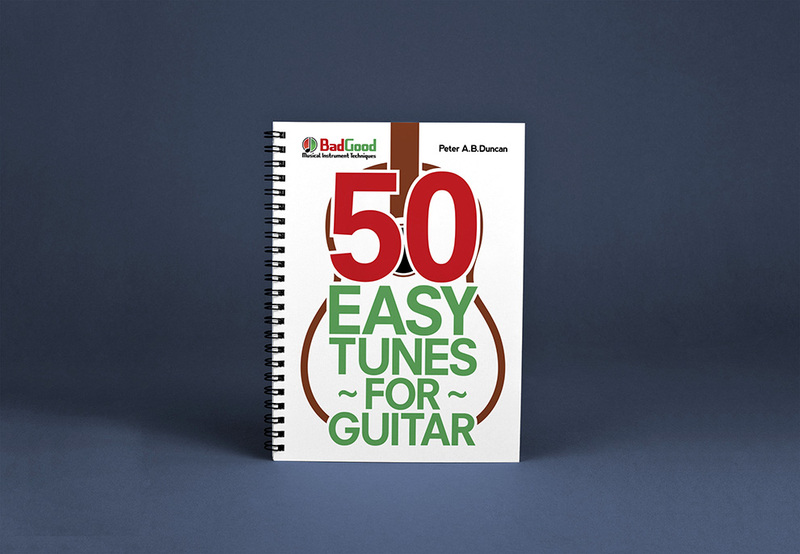 This spiral bound book cover was designed for ‘50 Easy Tunes for Guitar‘ which is the third book in the series of ‘Bad Good Musical Instrument Techniques’, following on from ‘Bad Guitar Good Guitar‘ and its Repertoire. The cover is based on the original ‘Bad Guitar Good Guitar’ design: the text follows the same red/ green colour scheme with a big red number ’50’ dominating the page to capture the eye, in order to set a target in the mind of the reader to accomplish the 50 tunes of the book. All 50 tunes are original songs written by the author Peter Duncan, with each tune becoming more challenging as you progress through the book.